Caffeination and ultralight backpacking. Two activities that really appeal to me. Put them together in one product and visions of moving fast and light while still enjoying a good cup of coffee begin to dance in my head. 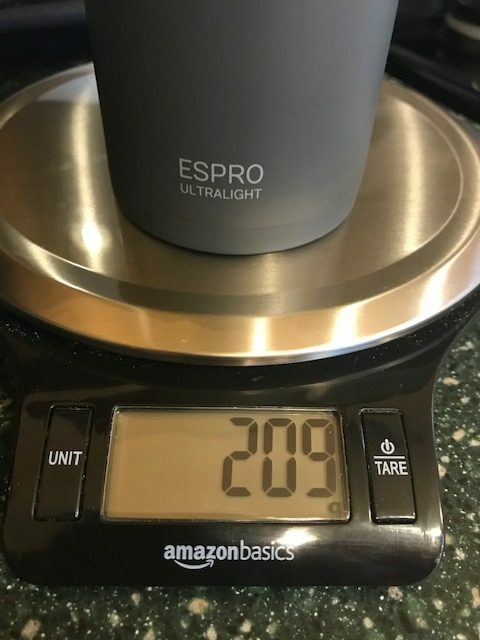 When Espro offered me a chance to check out their new Ultralight Coffee Press, I couldn’t resist the opportunity to give it a test drive. Coffee is one of the little luxuries I give myself when I’m on the trail. Making that hot cup of joe in the morning means adding a little time to my routine and burning a bit more fuel, but it’s totally worth it to me. On the other hand, I’m not that particular in what I drink. A packet of Starbucks Via or some Cafe Bustelo has always done the trick. So would an extra nine ounces or so be worth the addition of weight and time to my routine? 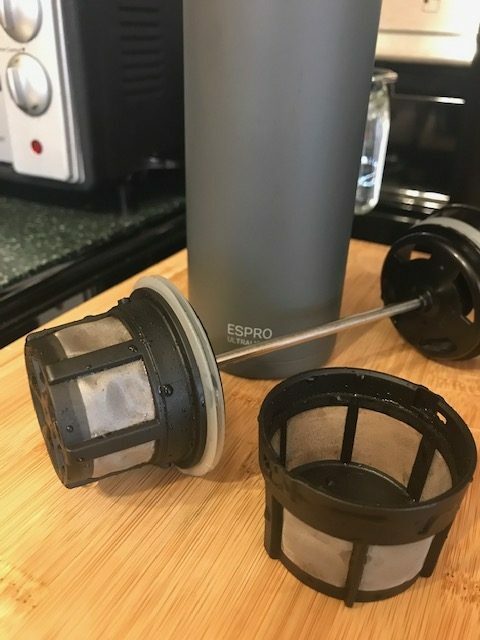 The slim Espro Ultralight Coffee Press. My first impression of the Espro Ultralight was quite positive. The construction is solid, with a sturdy metal shell and a rugged screw-on plastic top that’s carabiner compatible. All the press components fit neatly inside with the lid on, and the slim design made it an easy fit in the stretchy side pockets of my tried and true Osprey pack. As advertised, the Ultralight weighs in at around 210 grams (sans press). I weighed the Ultralight (empty) on my digital scale to compare it with the published specs. 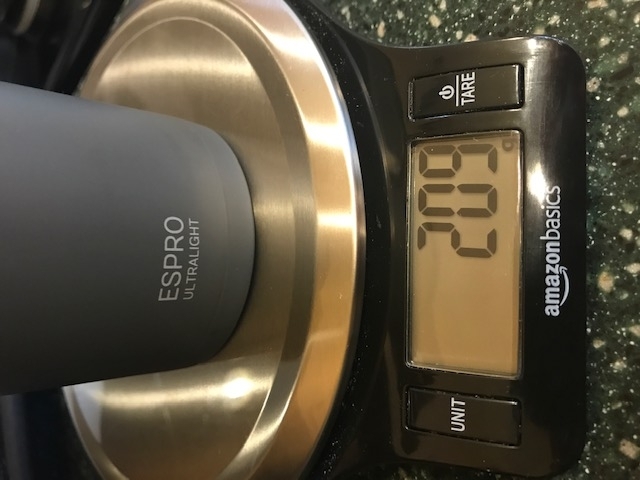 Espro claims a weight of 210 grams for the bottle, which matched pretty closely with my result of 209 grams. Important caveat—that weight doesn’t include the press. Add that in and you’re tipping the scale at 272 grams. Still pretty light, but a little over a half-pound of weight for the entire rig. The capacity of the Ultralight measured in at the published 16 ounces. Maybe not enough for the coffee hound who needs a few cups to get revved up, but more than enough to charge me up to hit the trail. And hey, the emphasis is on quality, not quantity, right? Before hitting the trail with the Ultralight it was time to take it to my test lab (OK, my kitchen). I put on the kettle and then poured eight ounces of hot water in both the Ultralight and my trusty Yeti travel mug. Then both were put out on the porch for 30 minutes on a chilly 40-something day. 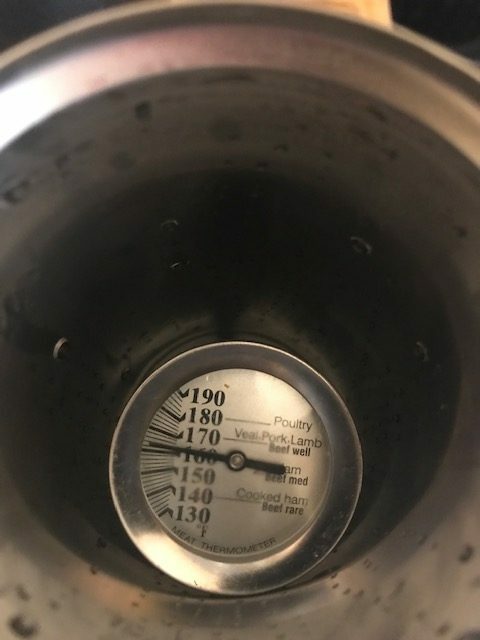 The Espro Ultralight holds heat very effectively. 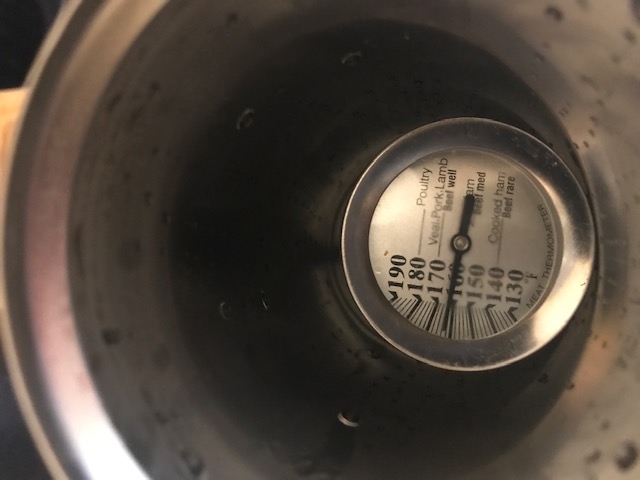 When I measured the water temperatures at the end I was somewhat surprised to see that the Ultralight had kept the water over ten degrees warmer than the Yeti. A pretty impressive performance! The Ultralight doesn’t skimp on filtration. Espro utilizes a double-filter system with all of their presses, including the ultralight, that reduces the amount of grounds and grit that make it into your brew. The promise is that this dual filter system will provide you with a flavorful and grit-free cuppa. My experience? A total winner with that. I didn’t have any issues with gritty coffee in any of my tests. The two-filter design of the Espro Ultralight means a grit-free cup of joe. 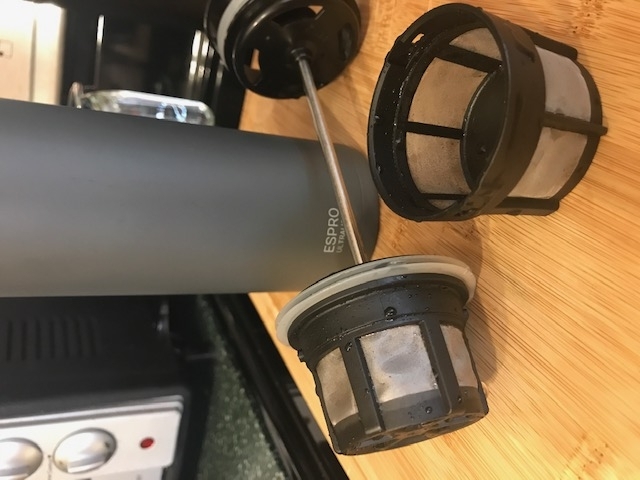 Using this Espro shouldn’t be an issue for anyone who’s used a coffee press before. I don’t usually use a coffee press, but didn’t have any problems getting the hang of the Ultralight. I took the Espro out on two different expeditions or testing. A cold December backpacking trip in the Blue Ridge Mountains near Charlottesville, and working as a crew member for an aid station at the Grindstone 100-miler. Here are my takes from those experiences. I used the press on several occasions during my two-night jaunt, both for brewing tea at night and for my morning coffee. A hot cup of tea is a welcome treat as the night begins to cool during the winter months. In the past, that’s been a fleeting pleasure for me, since my titanium mug cools rapidly. The Ultralight was a total game changer. With my hot tea in the Ultralight’s double-walled bottle, I sipped happily while watching hiker TV before I turned in for the night. And my morning experiences were similarly pleasurable. While I wasn’t fond of the extra work and cleanup involved in using the Ultralight’s press, I did enjoy having hot coffee that actually stayed hot. And with the screw top, I was able to pack a hot drink with me when I hit the trail in the morning and enjoy something warm at lunch. Working an aid station at the Grindstone 100 trail run meant working through late night and an early morning—the perfect excuse for excess caffeination. The Ultralight’s insulating advantage I described from my backpacking experience served me well here. I could count on a hot slug of coffee whenever I needed it between runners, and the screw-on lid meant that I didn’t have to worry about spills during the controlled chaos of the long night. And it was a real pleasure to enjoy a quality cup of coffee while playing in the woods. Pros: To me, the most impressive quality of the Espro Ultralight is the insulating power of the bottle. The construction is durable and it does the job—a much better job, in fact, than I expected. The press itself is sturdy and comes apart easily for cleaning. And there’s no doubt it makes a very good cup of coffee, with no annoying grounds or grit invading my drink. Cons: The cons have nothing to do with the quality of this product. It does what it’s designed to do very well. It’s just a matter of whether you’re willing to put up the small addition of weight to your gear and the bit of extra time involved in using the press to make coffee and cleaning up the grounds (LNT, folks!). I can do without a French press when I backpack. When you’re shaving grams, the extra weight of a coffee press isn’t insignificant. I also like to pack up and travel fast in the morning, so having a high-quality cup of coffee isn’t a make or break deal to me. But don’t take my personal gear preferences as a thumbs down for the Ultralight. 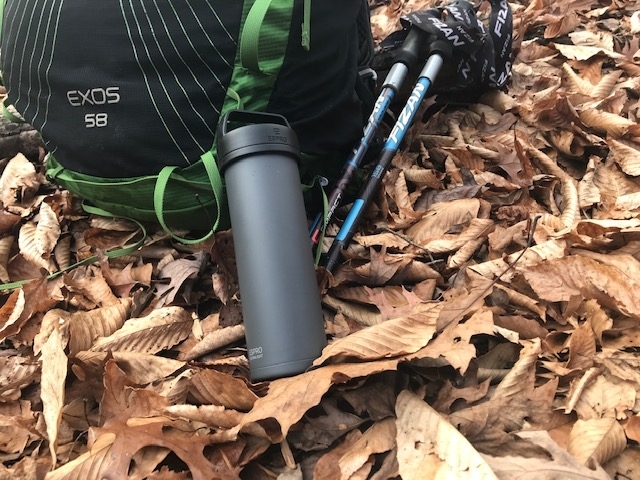 If I were embarking on an early- or late-season trip where cold, wet weather is a real possibility, I’d at least take the Espro Ultralight’s bottle with me. It’s light, tough, and keeps hot beverages hot. And that’s important not only as a luxury but as a safety measure as well. The Ultralight is a quality product worth considering for your gear list, even if you’re not a coffee aficionado. This product was donated for purpose of review.